There is no fundamentalism, or anti-Israeli ideology in the demonstrations in Libya, Egypt, Tunisia, etc .. It is a movement of young people spurred on by economic suffering and ideals such as democracy, equality, freedom, justice. The demonstrations are free of violence and hatred. Europe and the United States who have always supported dictators remaining blind to the needs of young people in these countries need to examine their conscience. Rome (AsiaNews) – What we are experiencing in North Africa and the Middle East is indeed a springtime in the Arab world. This whole region is changing and is proving something that had not been obvious so far: the importance of young people. The people who demonstrate, who keep in contact with each other and the outside world, spreading the news are all young people under 30 years of age. In these countries half the population is under 30. In all countries of the Middle East the average age of the population is between 29 and 31. These young people dream of having a job, and maybe getting married (but this means having the money to do so and therefore – once again – a job). Thus their demands are born of a most basic need. Added to this are then, we find the priority of values: democracy, freedom, equality, justice. These are the desires of all young people in the world, but in that situation, with the high proportion of young people, those wishes have become a mainspring of change. A second characteristic is the minor interest in international conflicts. In all these movements issues linked to America, Israel, the Palestinian struggle, the liberation of Jerusalem, etc.. have not emerged. For decades the Arab world has been witness to ideologized demonstrations. These young people are focused on national and social problems, they are not demonstrating for any ideology, right wing or left wing. In all these months, no American or Israeli flag has been burnt; no-one has made claims in defence of an Islam that must rule the earth. They do not want ideologies; they want realism. Along these lines, it is striking that young people want religion yes, but without fanaticism, which excludes all opposition between people of different religions. In recent days I was able to attend a rally to commemorate the death of Rafik Hariri in Lebanon on February 14. The ceremony took place in a room full of hundreds of people, high dignitaries and ordinary people, in Biel, Beirut. On stage before the commemoration, the Ave Maria was performed, sung by a Lebanese Christian soloist, interwoven with the Muslim call to prayer, performed by an Islamic singer. The two voices mingled such a profound and beautiful way that it moved many to tears. There is therefore, in this movement a desire for unity, peace, perhaps a little 'idealistic, but real. Just look at the photos that we published on AsiaNews in recent days (see Egyptian Revolution: Muslims and Christians united). During the demonstrations in Egypt, we could see even new and unusual gestures, like those women who kissed the soldiers as if they were their children, because the soldiers decided not to fire on the population. Even the military in Libya were mutineers, to the point that the government had to call mercenaries from sub-Saharan countries. At least five Libyan ambassadors have resigned, ministers have resigned, other soldiers have refused to bomb some cities. It is a movement that says no to dictatorship, a true springtime which we hope will not be disappointed. In this atmosphere, a formal or excessive religiosity never appears. It was not a problem that "bearded" (belonging to Islamic movements) appeared on the squares for freedom. But they did not form a solitary block among themselves, instead they mixed with the whole crowd. This unity is something new. Another element that clearly stands out is that everyone tried to demonstrate and push for change in a peaceful manner: in Egypt especially, but also in Bahrain, Tunisia and somewhat in Libya. It is as if the Arab world finally aspires to an era of peace. 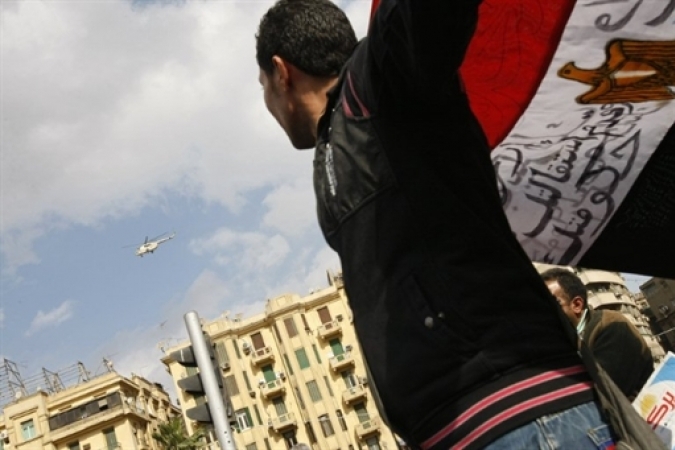 The peaceful element was also further emphasized by the fact that there was no animosity against Mubarak and against Ben Ali. There is something obviously, but there was no violence. This indicates a willingness to realise something good and new together. One element that surprises and worries me is the absence of leaders. Perhaps this is because these movements are made up of young people who have no ideological or fundamentalist vein. This is the dangerous aspect of the movement, perhaps in the future it may be stifled or subdued by some leader unworthy of their drive. On the other hand, these movements are reminiscent of those in Eastern Europe in 89. Even there, there was a domino effect for when regimes fell one by one without a shot being fired. This general impression gives me some confidence that young people will not be manipulated by extremist religious or ideological movements. If we look then to the West, what is more surprising is that all European governments admit that these changes have caught them unaware. How is it possible that Europe, which has so many economic ties with these countries, never noticed any signal? Perhaps Europe, in seeking relations with these regions, is only interested in its investments. This insensitivity or blindness points to a surprising void. Many rumours also abound that these revolts have all been orchestrated by America, so who wants to reassert its power from Morocco to Kuwait, redesigning the leadership of these countries and controlling all the oil resources of the region. It seems to me that this vision assigns the U.S. the role of manipulative superpower that it simply does not have. Instead, at this point, Europe’s task is to help without interfering. People do not want outside interference in their politics. But at the same time need to be sustained. These riots have led to an economic disaster: long strikes, destruction and misery. It would be good to reach out and help solve these problems. Moreover, it is time for Europe to take advantage of this new situation examine its conscience. What did we do with these regimes? We supported them. France and Tunisia, Italy and Libya, the United States and Egypt: in one way or another, these countries have had western sponsors. What is happening is an invitation to Europe to examine the support that it gives these regimes, to make sure that in future, the support Europe offers these countries is of a more positive nature.